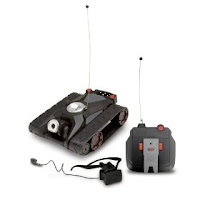 The Spy Video ATV-360 Remote Control Vehicle is a very popular toy for the 2009 holiday shopping season. Designed for kids age 7 year old and up, this remote control vehicle is designed to drive in all terrain with a real time video and listening display. The video and audio from the vehicle is transmitted wirelessly back to an LCD viewing screen headset and ear bud for watching and listening to the action. Here is the TV commercial for the Spy Video ATV-360.